The tiny kingdom of Bhutan is nestled in the Himalayan mountains, sharing a border with India, Nepal and Tibet, home to 800,000 people. 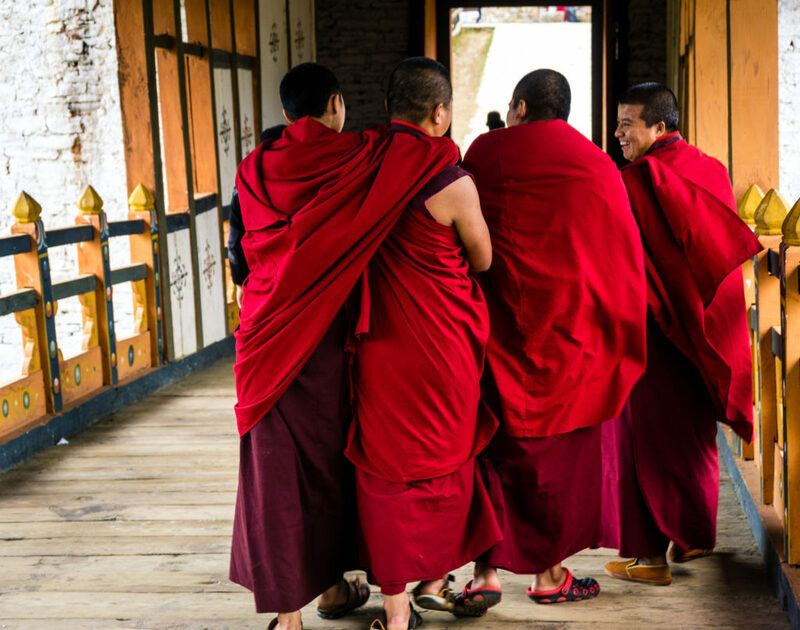 The landlocked country is full of historic Buddhist monasteries, fortresses, beautiful mountain landscapes and some of the world’s happiest people. As I wrote in a previous post, everyone (except citizens of India, Maldives and Bangladesh) must apply for a visit and use the services of a local tour operator. Your tour company will assist you with the visa process. You’ll pay a daily tariff to the tour company, which ranges in prices from $200 to $250 depending on when you’re visiting. Although the price may sound steep, the cost includes your accommodation, food, services of a tour guide and transportation. If you’re a solo traveler, you’ll need to add $40 per night. If you’re traveling as a couple, you’ll add $30 per person per night. Additionally, there’s a $40 for the visa itself. 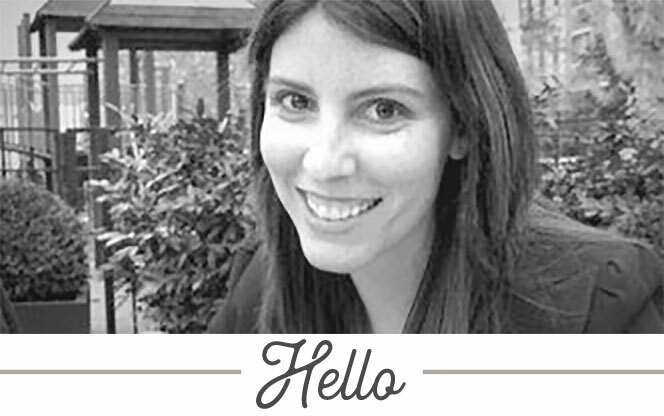 Once your visa is issues, look at it closely to make sure your name isn’t misspelled. There was a typo in my visa and a lot of drama ensued at the Delhi airport, which I would’ve preferred to avoid. 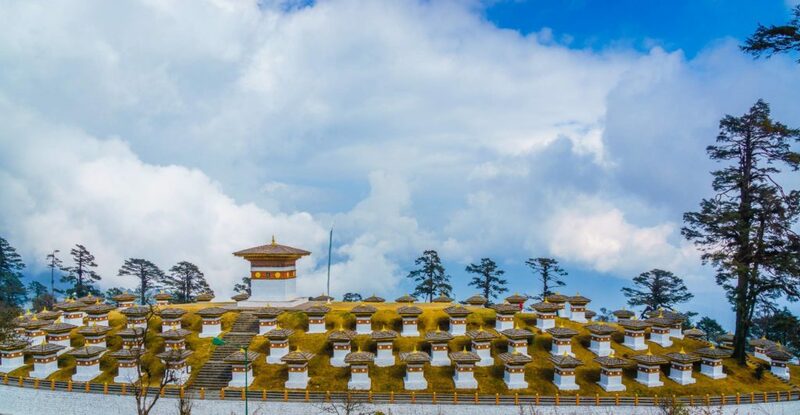 Bhutan is a year-round destination so the best time to visit is really a personal preference. You’ll see spectacular flowers if you visit in the spring (March to June) and you’ll have crisp, clear days if you visit in the autumn (September to November). The largest and most colorful festivals (tsechus) also take place around this time and attract a large share of tourists. This is definitely high season so you’ll want to make sure to book in advance so that you have your choice of accommodation as well as flights. Summer (June through August) is a great time to visit since the daily tariff is lower and the valleys are lush. Even though it’s monsoon season, my guide said it usually rains once in the afternoon and it isn’t too heavy. I try to travel during the off-season whenever I can so I visited in the winter (late January). There were very few tourists and the plane was half-empty on arrival. The temperatures are pretty cold and it’s not uncommon to see snow. If you plan on visiting rural areas, you may want to fly on Druk Air since the roads may be impassible due to snow fall. 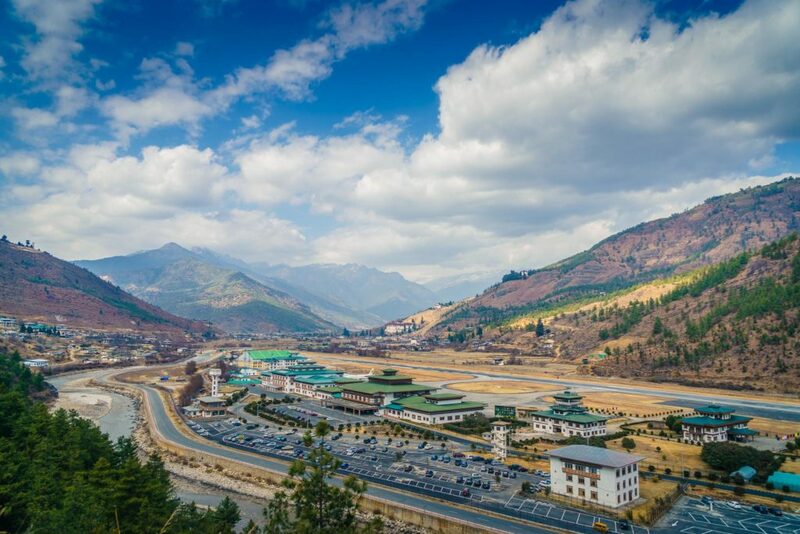 There are only three land border areas open to tourists: Phuentsholing, which is 6 hours away from Thimphu, Gelephu, which is 10 hours away from Thimphu and Samdrup Jonghkhar, which is 3 days away from Thimphu. 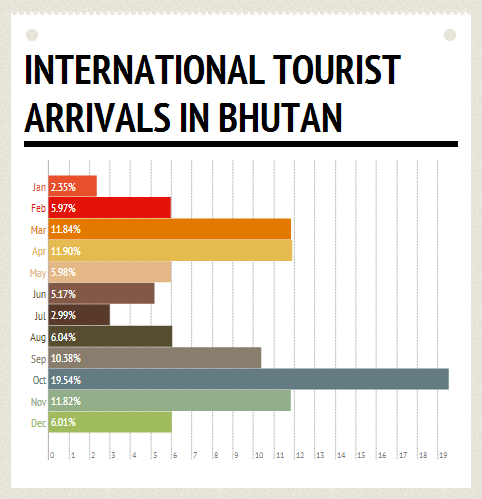 Most tourists will arrive by air to Paro, Bhutan on one of two airlines: Drukair and Bhutan Airlines. There are currently flights from the following locations: Delhi, Bangkok, Kolkata, Bagdogra, Bodh Gaya, Dhaka, Kathmandu, Guwahati, Singapore and Mumbai. If you’re flying from Nepal or India, make sure to request a window seat on the left seat of the plane on arrival for spectacular views of the Himalayas. If the weather is clear, you’ll see Mt. Everest, Lhotse, Makalu and Kanchenjunga. If you can, I recommend buying a business class ticket on Druk Air. You’ll enjoy a much more comfortable seat (complete with footrest) and amazing service. Good news for spicy food lovers: Almost all the local food in Bhutan is served with red and green chilis. If you like fire-in-your-mouth levels of spiciness, you’ve come to the right place. My guide, Dhoji, told me that a lot of tourists don’t like Bhutanese cuisine because it’s too hot. I think he was surprised when I ate a meal with him and enjoyed every dish on my plate. The country’s national dish, ema datse, consists of fiery chillies and farmer’s cheese, served with local red rice. 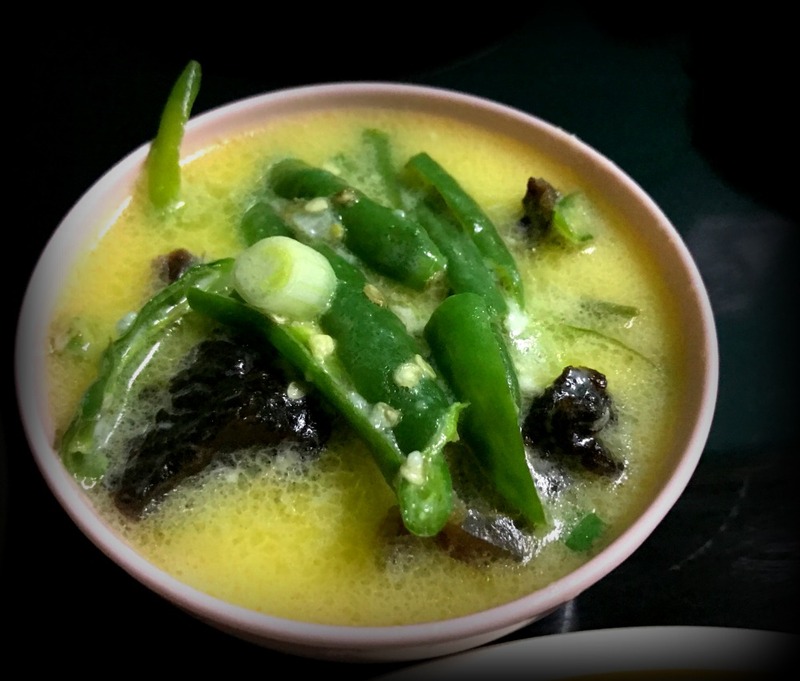 To make it even more spicy, it often has dried chillies on top. If you’re not a fan of spicy food, don’t worry. All the hotels serve dinner and they tone the spicy level way down for westerners. 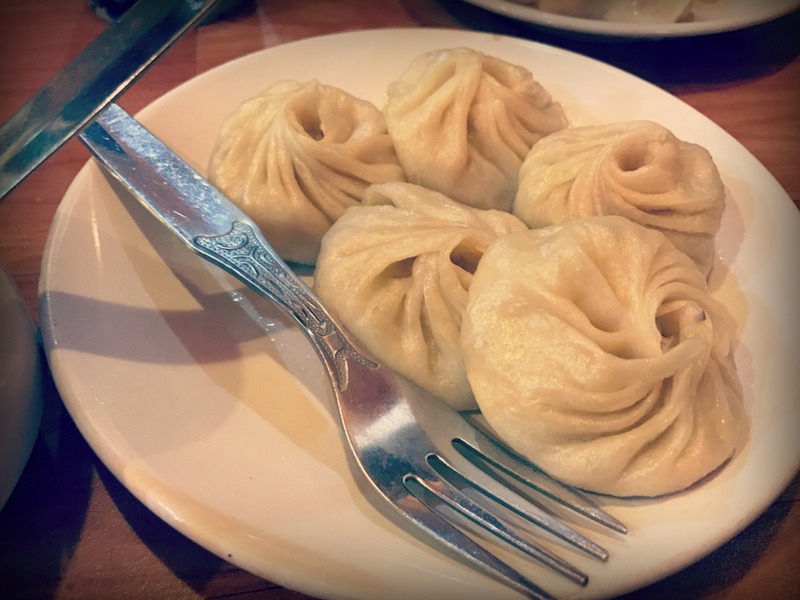 You’ll find a lot of Indian dishes, western dishes as well as some Bhutanese dishes with fewer chilis. One note about meat in Bhutan: no animals are slaughtered in Bhutan but meat is consumed in the country. It’s brought to Bhutan from India via refrigerated trucks. While there are ATMs in Paro and Thimphu, they aren’t always reliable so make sure you bring USD or Indian rupees with you in case you can’t withdraw your funds. The ngultrum is the currency and it’s tied closely to the Indian rupee. Bhutan is a stunning place to photograph and while smartphones take wonderful pictures, I recommend bringing along a real camera. 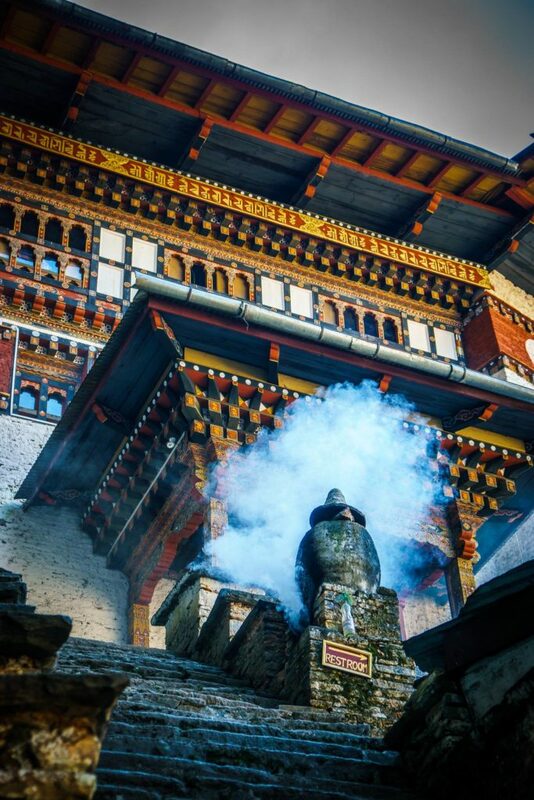 Keep in mind that photography is not allowed inside most monasteries and temples. If you have to take your shoes off, you probably aren’t allowed to take a photo. 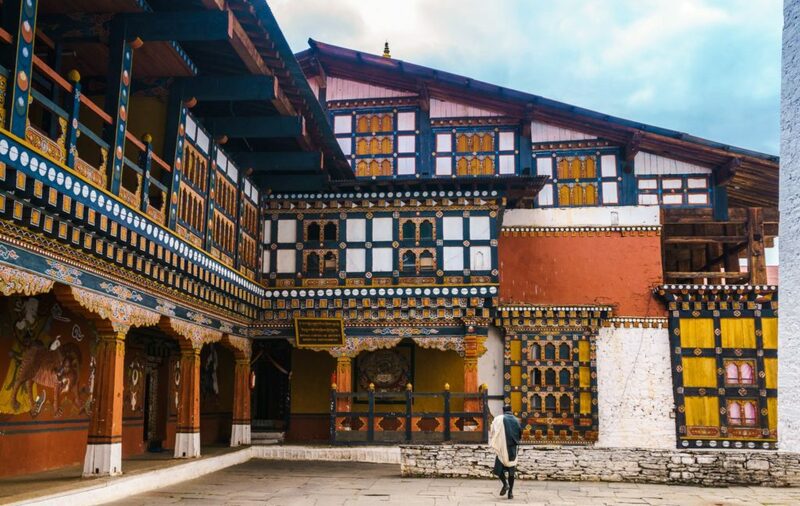 Since Bhutan is such a small country, you may encounter the royal family. One morning in Punakha, the driver pulled the left side of the road and waited for some oncoming vehicles to pass. He told me that the entire royal family just drove by and they had likely visited the Punakha Dzong. If you do happen to spot the royals, don’t take their photo unless you have explicit permission. Along those lines, don’t disrespect the royals. The Bhutanese people hold the monarchy close to their hearts and you’ll see photos of the royal family in museums, restaurants and shops. Your cell phone may not get service in Bhutan (mine certainly didn’t). 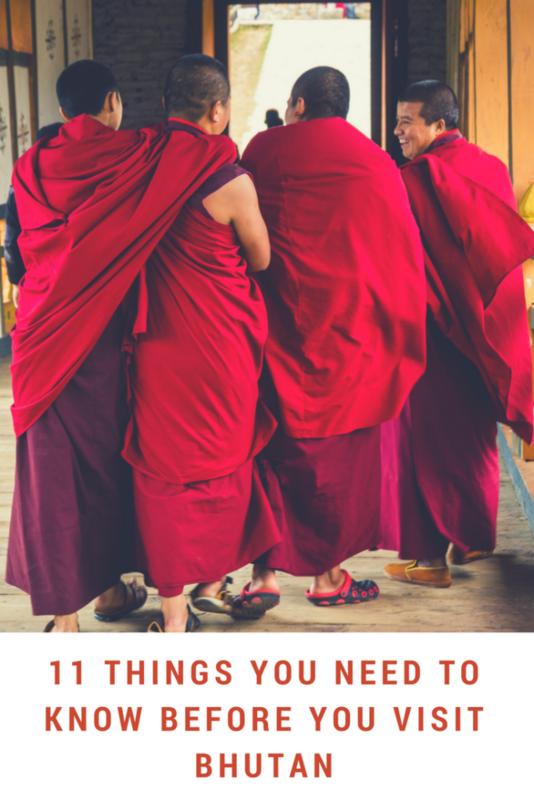 If you need to stay connected, plan on buying a Bhutanese SIM card. Wifi is available in all the hotels but is probably much slower than what you’re used to back home. I was able to check Facebook but downloading email and trying to use FaceTime was pretty much impossible. I visiting in the middle of winter and the temperatures ranged anywhere from 30 F to 65 F in the course of a single day. If you’re visiting in the winter, plan on bringing a warm jacket, gloves, hat and warm pants. When you’re hiking, particularly at Tiger’s Nest, you’re going to want to shed your jacket so make sure you have a warm shirt underneath. You’ll also need to dress modestly and respectfully at temples which means long pants and covered shoulders. You’ll need to remove your shoes when entering the temples so I definitely recommend wearing socks so that you don’t have to walk around barefoot. While all the hotels have heat, it wasn’t as strong as I was used to so plan on bringing along a warm pair of pajamas in the winter. 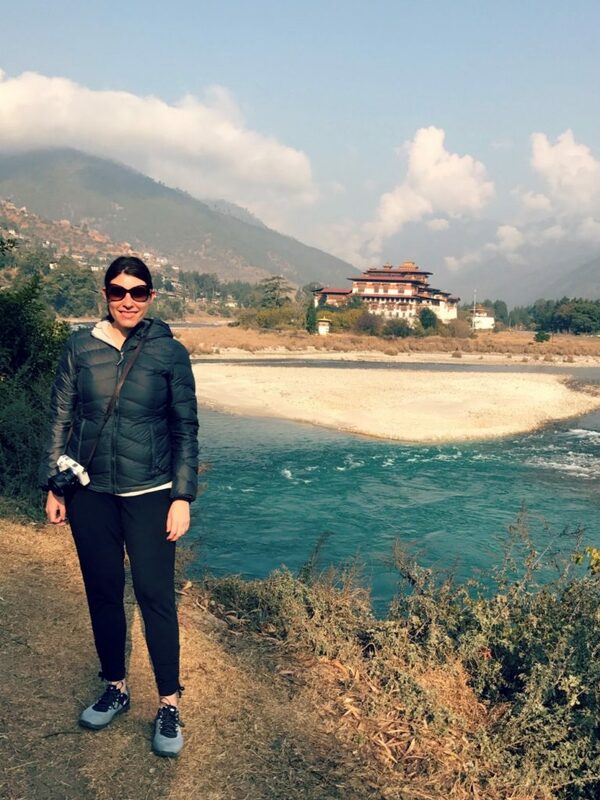 Bhutan is at a high altitude so you’ll need to bring sunglasses and wear sunscreen, regardless of the time of year. 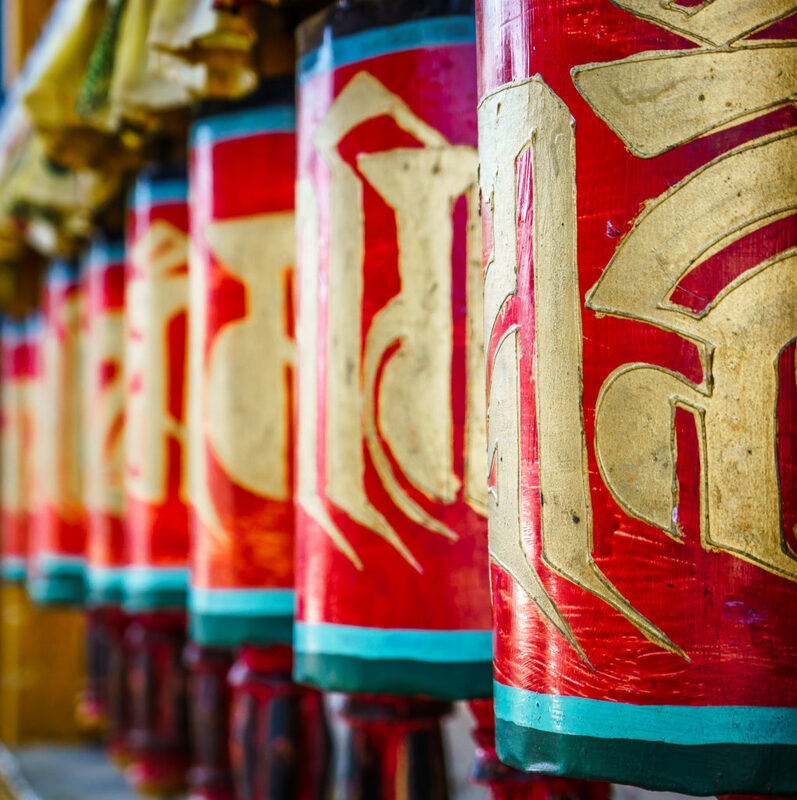 Bhutan’s official language is dzongkha, with an additional 19 languages being spoken throughout the country. You’ll primarily hear dzongkha in Thimphu, Paro, Punakha, Haa, Wangdue and Phodrang. Even though the words are incredibly challenging to speak, you’ll earn respect from the Bhutanese for attempting the language. Packs of dogs roam the streets of Thimphu, Paro and Punakha. They seemed pretty harmless and begged for food when I was hiking up to Tiger’s Nest Monastery. That said, I still wouldn’t pet them since they’re wild and may bite. Of course, the packs of dogs are active during the day and spend all night barking as loud as possible. You’ll need to bring earplugs so that you can block out the sound of all-night barking and yelping. 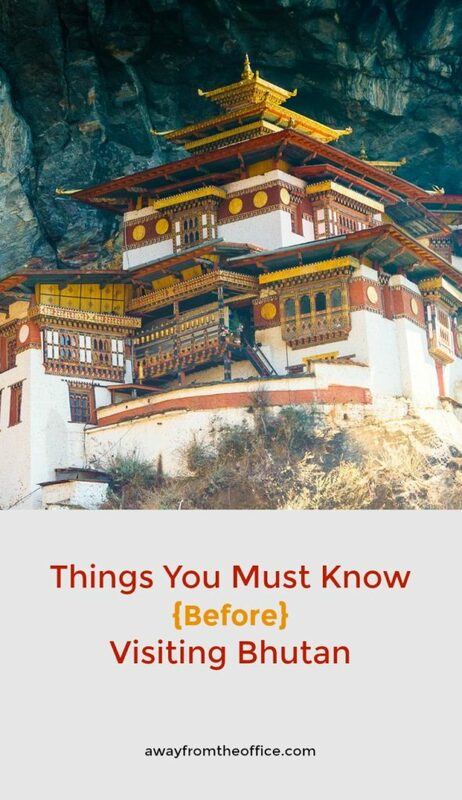 What a great comprehensive guide for Bhutan. We can’t wait to go and this is so high up on our list. Paro Dzong is so beautiful wow! 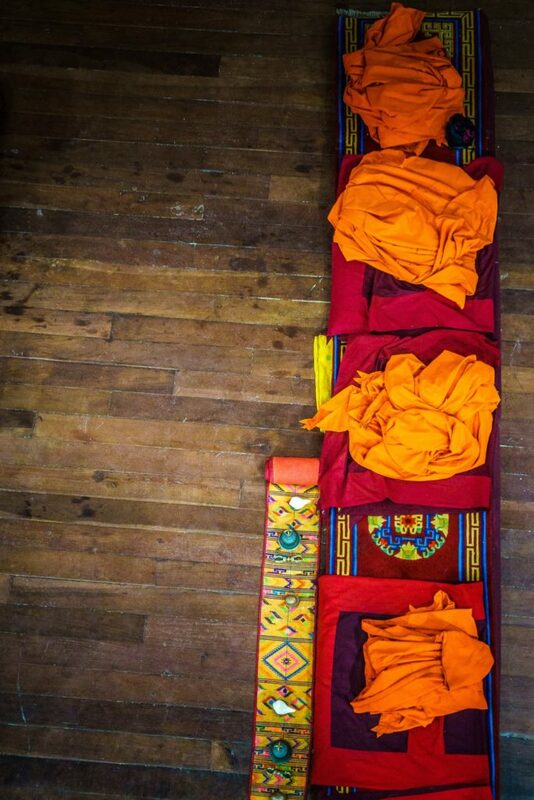 This is getting me so excited for Bhutan! It’s on the top of my bucket list and I’m trying hard to convince my family/partner to travel there with me. Beautiful photos, Rebecca! This post was very thorough, I had no idea that you required so much pre-planning to visit. I really enjoyed how detailed this post was and how beautiful the photos turned out, you are right, its great for photography. I am a solo traveler and the idea of travelling here sounds very crazy. Looks absolutely beautiful though and I hope one day I can be as adventurous as you. So much great information! 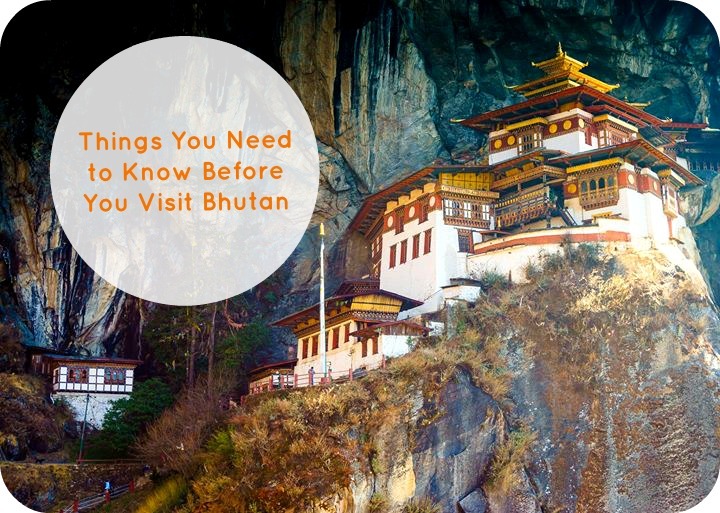 You’ve included basically anything I would need to know to visit Bhutan. It seems like an entirely different world and something unlike anything I’ve ever experienced. It wasn’t on my radar before, but it seems fascinating! This is the best post I’ve ever read about Bhutan! All the information is here, from how to apply for a visa to the cost of a guide, how to arrive, the local food and photography. I can see your photos were taken with a real camera as they are very detailed! I have actually seen the Prince of Bhutan, he was on a state visit to Thailand and was touring Chiang Mai, I’d love to see him a second time in Bhutan too! I think Thai people are visa exempt too because of the royal connection. Excellent article! I had no idea that you have to have a guide all the time when you visit there. Pretty interesting. They really keep constant tabs on foreigners. Your pictures are great and even the food looks quite good! I’d try the really spicy one, not sure if it’d be too spicy for me, but how would you know till you try it? I pinned this too so I can reference back if even needed, thanks for the great info! This was so helpful as Bhutan is a place I truly wish to visit. I have read about the visa process and knew it would be through a tour company to get there, but sheesh, sorry to hear about the typo in yours that caused you grief! I would need to eat the westerner food unless they could tone down the spiciness. I can’t handle too much as it is. Great post on the one country that boasts Gross domestic happiness! 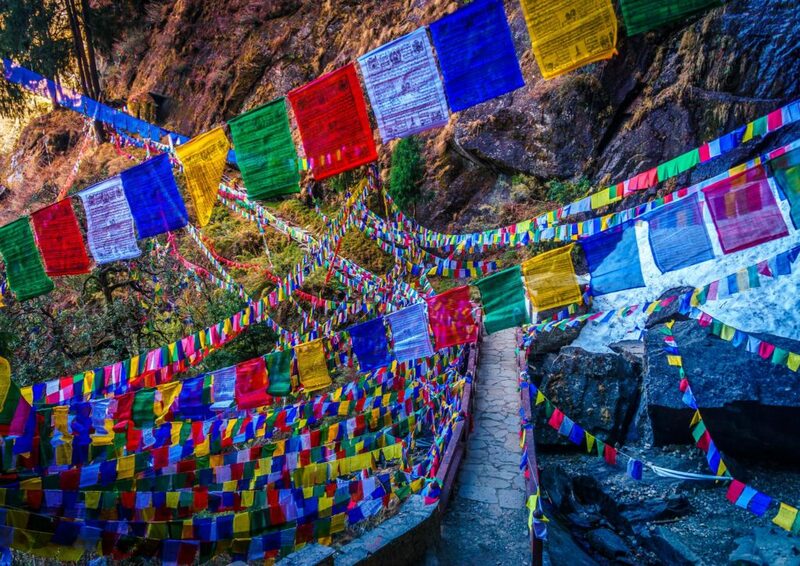 Oh I would love love love to visit Bhutan! My boyfriend is Indian so for once it’s a lot easier for him to visit than me. Hopefully we’ll be able to go in a few years time when we have a bit more money saved! It sounds like such a peaceful and fascinating country, I really want to go before it becomes overrun by tourism and the influences of the West. Thank you for such an indepth post, it’s so clear cut and helpful about everything to expect. This is totally on my bucket list! 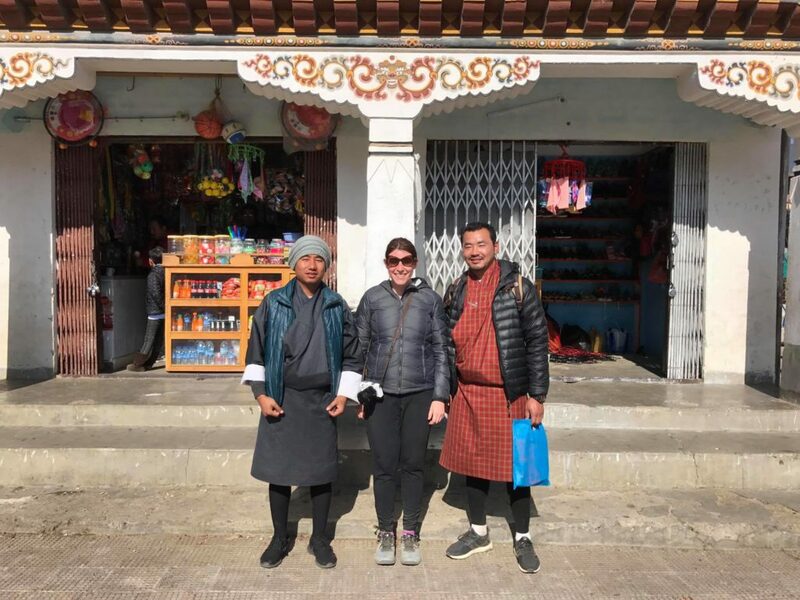 I have very little knowledge about travelling to Bhutan, so this post is really helpful. 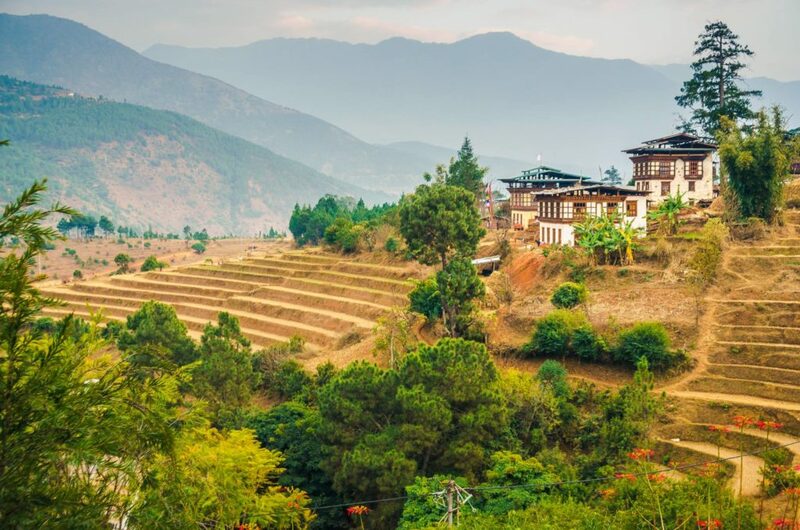 While the $200-$250 per day, per person is expensive, I think it would still be worth it because Bhutan looks untouched still by mass tourism and it’s landscape looks incredible. Good to know to double check the visa before going – I can only imagine the hassles you faced at the Delhi airport. This is great! Thanks for addressing the costs part too, I’d initially thought it costs more than USD$200 per day just for the tourist visa itself, and resigned to the fact that I’ll never get to visit Bhutan since it’s so expensive. Glad to see the clarification from your post! Hopefully one day I’ll get to visit this beautiful country and learn all about its culture! This is really, really informative.What tour company did you use? Do you recommend them? How many days did you stay there?